This article is about the Canadian politician. For the swimmer, see Ahmed Hussein. 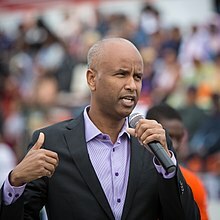 Ahmed Hussen MP (Somali: Axmed Xuseen; Arabic: أحمد حسين‎; born 1976) is Minister of Immigration, Refugees and Citizenship for the Government of Canada. He is also a lawyer. He was National President of the Canadian Somali Congress. As of October 2015, Hussen is an MP in the Canadian Parliament, representing the York South—Weston riding as a member of the Liberal Party of Canada. Hussen was born and raised in Mogadishu, Somalia. He has five older siblings and his father was a long-distance trucker. Hussen learned to speak English there from a cousin. He and his family left Mogadishu after the Somali Civil War reached their neighbourhood. They lived for a period of time in Kenya, in a camp in Mombasa and several apartments in Nairobi. Two years after leaving Mogadishu, Hussen's parents bought him an airplane ticket to Toronto, where two of his brothers had already moved. He initially resided with a cousin in Hamilton, and moved to Toronto in 1994, where he settled in Regent Park in 1996. Hussen completed secondary school in Hamilton. Due to a Canadian government policy that delayed granting permanent residency status to emigrants from Somalia, he had to decline three running scholarships to universities in the United States. Hussen eventually attended York University, where he earned a BA in History in 2002. Having received a law degree from the University of Ottawa, and passed the bar exam in September 2012, he specialized in the practise of immigration and criminal law. Hussen is married to Ebyan Farah, a fellow Somali-Canadian refugee. Together, they have three sons. Hussen began his career in public service and politics in the fall of 2001. He started out doing volunteer work in Legislative Assembly of Ontario. He was hired the following year as an assistant to Dalton McGuinty, the leader of the province's official opposition. Hussen worked in this capacity until November 2003, when he was promoted to Special Assistant, concurrently with the Liberal Party's election victory. He held this new post for two years, during which he was in charge of issues management, policy and communications. Hussen later worked with the Royal Canadian Mounted Police's Youth Engaged in National Security Issues committee. He also founded the Regent Park Community Council. The representative body facilitated a $500 million revitalization and redevelopment project in Regent Park, the largest such initiative in the country. During the project's implementation, he was tasked with consulting with and protecting the interests of the area's 15,000 residents. Hussen currently serves as the National President of the Canadian Somali Congress (CSC). Under his leadership, the CSC partnered with the Canadian International Peace Project and Canadian Jewish Congress to establish the Canadian Somali-Jewish Mentorship Project. It is the first national mentoring and development project between a sizable Muslim community and the Jewish community. In May 2010, the Canadian Somali Congress and Canadian International Peace Project also partnered with the Global Enrichment Foundation to launch the Somali Women Scholarship Program. Hussen acts as the program's founding Director. Until 2012, Hussen served as a sitting member of the Stephen Harper government's Cross-Cultural Roundtable on Security. Established in 2005, the panel brought together prominent members from a number of Canada's cultural communities and government officials in order to discuss policy and program issues, and to promote dialogue and strengthen understanding between the national authorities and its electorate. Before his entry into politics, Hussen practised Criminal Law, Immigration and Refugee Law, and Human Rights Law at his office in Toronto. In December 2014, Hussen presented himself as a candidate for a Liberal Party of Canada seat in the riding of York South—Weston for the 42nd Canadian federal election. He won the nomination in a field of six aspirants, which included the Green Party's John Johnson. The victory makes Hussen the first Somali-Canadian elected to the House of Commons. On January 10, 2017, Hussen was appointed Minister of Immigration as part of a cabinet shuffle by Prime Minister Justin Trudeau. The nomination makes Hussen the first Somali-Canadian to serve in the government cabinet. As immigration minister Hussen announced on 2017 the Government of Canada will welcome nearly one million immigrants over the next three years. The number of migrants would climb to 310,000 in 2018, up from 300,000 in 2017. That number was to rise to 330,000 in 2019 then 340,000 in 2020. On October 31, 2018, Hussen announced that the Government of Canada had updated its multi-year immigration levels plan, which would see the number of new immigrants in Canada rise to 350,000 by 2021. This plan was to see immigration levels rise by 40,000 more than Canada's target of 310,000 immigrants in 2018. The planned increases were set to reflect needs in the economic class of immigration to aid with Canada's labour shortages, as well as in humanitarian streams of immigration. In a 2018, Angus Reid Institute poll found that Hussen is one of the least popular ministers in Trudeau's cabinet. Hussen has over the years received honours and recognition for his public work. In January 2004, the Toronto Star named him among the 10 individuals who have made significant contributions to Toronto in various fields, including community service, business, sports and science. In 2017, Hussen was presented with the RBC Top 25 Canadian Immigrant Awards, an award that honours the achievements of immigrants who have chosen to make Canada their home. Hussen was also presented a Queen's Jubilee medal and the Ontario Non-Profit Housing Authority Award for his efficacious advocacy work in Regent Park. ^ "HUSSEN, The Hon. Ahmed, P.C." Library of Parliament. Retrieved September 8, 2017. ^ a b c d Porter, Catherine (September 6, 2017). "In Canada, an Immigration Minister Who Himself Is a Refugee". The New York Times. Retrieved September 8, 2017. ^ a b c d e f "Community KnewZ, Volume 1, Issue 1, 1 April 2013" (PDF). RPNI. Archived from the original (PDF) on January 11, 2014. Retrieved September 11, 2013. ^ a b c d e "Ahmed Hussen". American Islamic Leadership Coalition. Retrieved January 11, 2014. ^ "Only a fool would underestimate Justin Trudeau in this year's federal election (archive.org)". Leaders and Legacies. January 24, 2015. Archived from the original on July 3, 2015. Retrieved April 5, 2018. ^ "The Honourable Ahmed D. Hussen MP". Government of Canada. February 22, 2017. Retrieved April 25, 2017. ^ "National President, Canadian Somali Congress". Yatedo. Archived from the original on January 13, 2014. Retrieved August 11, 2013. ^ "About Us". Canadian Somali Congress. Archived from the original on August 31, 2013. Retrieved August 31, 2013. ^ "Somali Women Scholarship Program". Canadian International Peace Project. Retrieved January 11, 2014. ^ "Harper Government Reaches Out to Canadian Communities". Public Safety Canada. Retrieved January 11, 2014. ^ "Harper Government Reaches Out to Canadian Communities". Public Safety Canada. Proquest Newspapers. June 11, 2012. Retrieved May 5, 2015. ^ "Ahmed Hussen - Liberal Nomination - York South Weston". Ahmed Hussen. Retrieved December 9, 2014. ^ "Ahmed Hussen wins YSW Liberal nomination". WestonWeb. Archived from the original on December 13, 2014. Retrieved December 9, 2014. ^ "Chrystia Freeland becomes foreign minister as Trudeau shuffles cabinet". CBC News. January 10, 2017. Retrieved January 10, 2017. ^ "Freeland promoted to Foreign Affairs, McCallum goes to China in cabinet shuffle". CBC News. Retrieved January 10, 2017. ^ Harris, Kathleen; Hall, Chris; Zimonjic, Peter (November 1, 2017). "Canada to admit nearly 1 million immigrants over next 3 years". CBC News. Retrieved January 26, 2019. ^ McCarthy, Preeti (November 10, 2017). "Canada to take 1 million immigrants by 2020". SBS. Retrieved January 26, 2019. ^ Lam, Eric (November 2, 2017). "Canada to Admit Almost a Million Immigrants Over Next Three Years". Bloomberg. Retrieved January 26, 2019. ^ "Federal Cabinet Ratings: A happy new year for Freeland; Hussen, Sohi face cold winter". Angus Reid Institute. December 14, 2018. Retrieved January 27, 2019. ^ "Justin Trudeau: Three challenges facing him in 2019". BBC News. January 3, 2019. Retrieved January 27, 2019.